Group photo of students honored at the Citizens for Safe Schools American Youth Character Awards on Monday night. Submitted Photo. In cooperation with the national Character Counts! Coalition, Citizens for Safe Schools host this awards process and ceremony every year, soliciting applications from schools and individuals in the Klamath Basin. The Awardees are selected not based on academic merit but rather, based on applicants’ demonstration of strength of character, namely the six pillars of character: Trustworthiness, Respect, Responsibility, Fairness, Caring and Citizenship. Six youth awardees were selected, and each youth received a certificate and $100 sponsored by AmeriTitle, and one teacher in the community was selected as the Character Builder winner, and received $500 to be used in their classroom. Zurick was nominated by his social studies teacher at Eagle Ridge High School, Emilie Benke-Witkowski, who specifically emphasized Zurick’s commitment to the pillar of respect, and the role he takes in trying to educate and understand others whose views conflict with his own. Samantha is a student at Klamath Union High School who was nominated by Britt Clark from Youth Rising, for her tremendous spirit of volunteerism, clocking over 200 hours volunteering as part of the Youth Rising leadership institute and an exemplary example of the pillar of Citizenship. Cameron attends Henley High School, who was nominated by Henley High Principal Jack Lee. Cameron is involved in many community service activities in the community, and also at Doernbechers Children’s Hospital in Portland where he receives treatment for his osteosarcoma (bone cancer), where he has taken under his wing another young boy also fighting for his life. Christin is a student at Bonanza School, and she was nominated by her teacher Donna Radford. Christin lives all six pillars of character everyday. She is a positive role model for all other students, and has taken on many responsibilities and community service activities. Daniel is the ASB President at Chiloquin Jr/Sr High who was nominated by his teacher Jenny Dunham. She says that Daniel is an inspirational leader, who truly cares about giving back to his community of Chiloquin and J is the driving force behind many of the movements and activities that take place within his school. Sage Waters is a student at EagleRidge High School, who was nominated by her Citizens for Safe Schools mentor Kayla Breedlove, who says that Sage really shines when it comes down to responsibility and trustworthiness, and always goes above and beyond her duties in anything she is involved in, and truly makes a difference in the lives of her friends and family, and puts other peoples need sin front of her own. Brandon Powell as the Character Builder Awardee, of Stearns Elementary. Nominated by the Blue Zones Project, Klamath County Public Health, and OSU Extension. Brandon Powell was selected as this years Character Builder recipient because of his unwavering dedication to his students and his school. One of his nominators Erin Schulten said, “Brandon Powell demonstrates the six pillars of character, but more importantly he creates opportunities for students to learn these character traits for themselves….Brandon strives to bring more resources to his school,, ensuring his students are provided with more equitable access to activities and he works actively in the community to build relationships”. Many more youth and educators were nominated for these awards, and selecting the winners was a hard decision, ALL those who were nominated will be receiving honorable mention certificates sent to their schools, with the intention of them being recognized by their community. If you have an outstanding youth or educator in mind, who demonstrates good character, please nominate them next year. 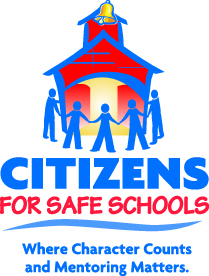 For more information about Citizens For Safe Schools visit www.citizensforsafeschools.org. Press release provided from the Citizens from Safe Schools.